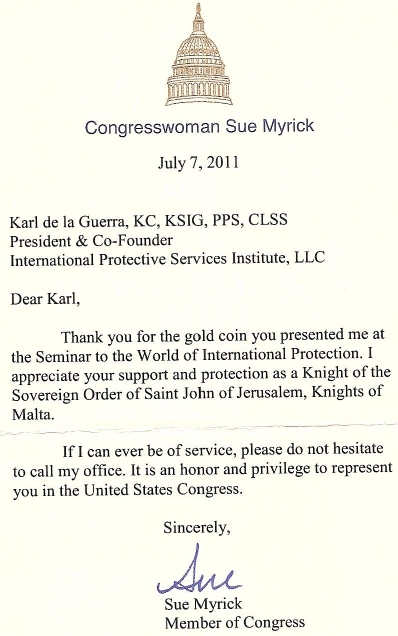 The attached Letter of Thanks is a great honour for us, which was sent to Sir Karl DelaGuerra – Knight of Sword and Silence (KMFAP and Sovereign Order of Cyprus) by Mrs. Sue Myrick, Representative of the U.S. Congress, who is currently in her ninth term representing North Carolina's 9th district. Mrs. Myrick serves as Chairman or Vice Chairman in numerous committees of the U.S. House of Representatives. She came to Congress in 1995 after serving on the Charlotte City Council and serving two terms as mayor of Charlotte, North Carolina, the state's largest city. Mrs. Sue Myrick remains the first and only female mayor in Charlotte history.